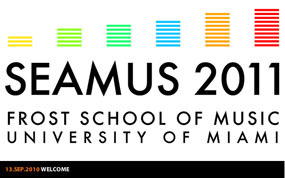 The purpose of this program is to stimulate student participation in SEAMUS activities, and to encourage young composers to pursue creative endeavors in electro-acoustic music. The program is administered by SEAMUS and funded by Frances Richard and the American Society of Composers, Authors and Publishers (ASCAP) . The postmarked deadline is October 15, 2010. A maximum of two prizes may be awarded. The decision of the judges will be final. * Recording of the submitted work on the SEAMUS Compact Disc Series. Applicants to the 2011 ASCAP/SEAMUS Student Commissioning Competition must be student members of SEAMUS and either a United States citizen or currently enrolled in an academic course of study within the United States that leads to high school diploma, or baccalaureate, masters, or doctoral degree in music or electro-acoustic music, or a program that includes electro-acoustic music and related fields.